﻿ How to Stand Out on LinkedIn With Visual Content » Red Mango Marketing! You know consumers like to research businesses online before making a purchase. But did you know that they’re also looking for information about the people behind the business? It’s happening on LinkedIn. 77 percent of LinkedIn users say they’ve used the platform to research people, as well as companies. How can you stand out on LinkedIn? Use visual content in your personal profile to grab attention and showcase your expertise. Use a tool like Canva, PicMonkey, or Adobe Spark to resize images (check out our image size guide for dimensions), create a collage, and add text to explain what you do. Because the banner image is at the top of your profile, people will learn about your skills even if they don’t scroll through your entire profile. Here’s an example from Constant Contact’s Authorized Local Expert, Bryan Caplan. Bryan lists his Constant Contact certification and the services he provides in his banner image, so you get a sense of his expertise right away. You can link to visual examples of your work in the LinkedIn summary and job experience sections of your personal profile. Add your media by using the tools below one of your job experience entries. LinkedIn will create an image that links to where your document, photo, website, video, or presentation is hosted. Here’s an example of my portfolio in my LinkedIn profile’s summary. 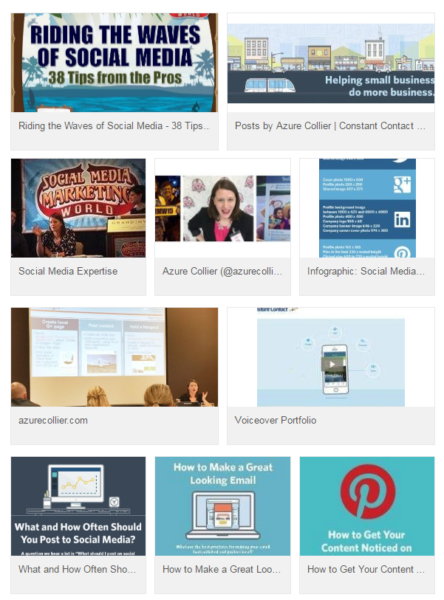 I’ve pulled together several different types of media, including SlideShares, Pinterest boards, infographics, and links to blogs. 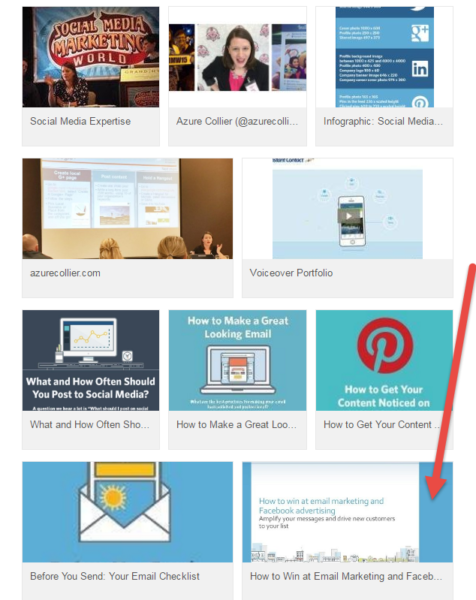 LinkedIn owns and integrates with SlideShare, so take advantage of that partnership to publish webinar slides, collections of tips, infographics, and more to SlideShare, and then connect them to your profile to build your portfolio. Pro tip: If you have a recording of a recent webinar, you can upload the slides and embed the video recording in the slide upload. After you’ve uploaded your files to SlideShare, connect them to your personal profile summary or a job experience as part of your portfolio. LinkedIn’s Publisher feature — which is only for personal profiles, not business pages — is a great way to publish original blog posts or to reuse blog posts you’ve written elsewhere. The key here is to include an image that will get your blog post noticed. 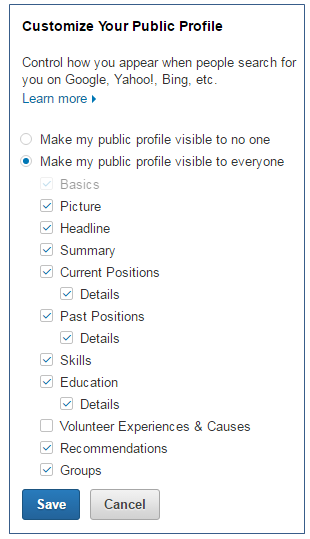 Your LinkedIn Publisher posts will be displayed at the top of your profile. Your post may appear in the feeds of your connections or LinkedIn users who have shown interest in the topics you write about. LinkedIn Publisher posts are also indexed by Google, which gives you even more potential exposure. How can your visuals get more visibility? The banner image and portfolio are only accessible to your LinkedIn connections. 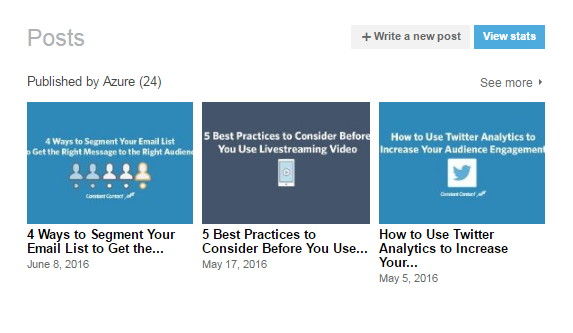 Your SlideShares can be viewed on your SlideShare account if you make them public. Your LinkedIn Publisher posts can be seen by your connections and you can make them visible to the public. From there you can control what appears in your public profile and save any changes you make. 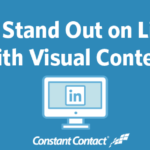 Visual content will take your LinkedIn profile to the next level. When you use images to call attention to your expertise and skills in your banner image, portfolio, SlideShares, and LinkedIn Publisher posts, current and potential customers can get to know more about what you do and how you can help them solve their problems. For more information on LinkedIn, check out our LinkedIn 101 page. 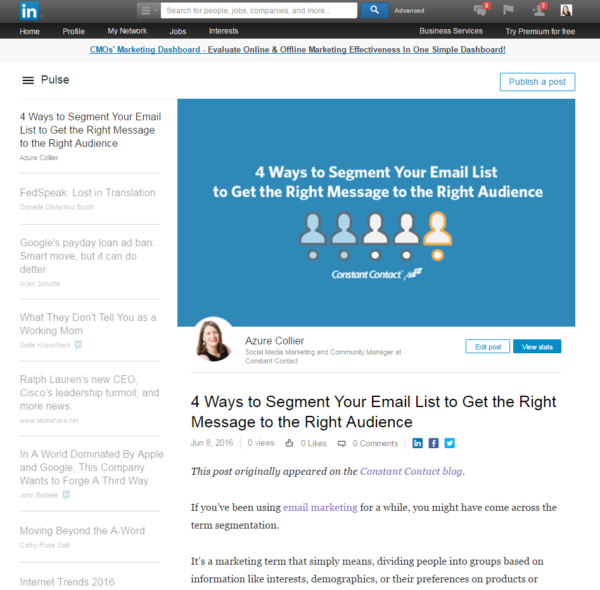 The post How to Stand Out on LinkedIn With Visual Content appeared first on Constant Contact Blogs. This entry was posted on Thursday, June 9th, 2016 at 10:00 am	and is filed under LinkedIn, News & Updates, Social Media Marketing, Visual content. You can follow any responses to this entry through the RSS 2.0 feed. Both comments and pings are currently closed.